Berkhamsted Gymnastics Club elite gymnast Gabby Connolly impressed for the English squad in her junior international debut last month. Gabby’s impressive feat has been part of a historic year for Berkhamsted Gymnastics Club, with elite gymnast Gabby not only gaining a place in the English Junior squad, but also leading the English Junior team to success in her first junior international. The 13-year-old, also known as Tigger, first broke onto the national circuit in 2016 when she finished second at the British Challenge Cup, qualifying to compete at the British Espoir Championships. Despite injury along the way, Gabby has continued to climb up the ranks, hitting new levels in February this year when as a first-year Junior she was sixth overall at the English Championships, winning a bronze medal on vault and beating current Great Britain squad members to the podium. Strengthened by her success at the English Championships, Gabby then went on to gain a strong eight-place finish at the British Junior Artistic Gymnastics Championships at the Echo Arena in Liverpool in March. Gabby’s success at the British and English championships gained her a place as a Great Britain squad invite gymnast, and a full place in the 2018 England squad. Her debut for the Junior English Team was quick to follow and she and her team-mates flew out to Germany to represent England at the Leverkusen Cup in Germany last month. The prestigious competition welcomed international teams from Europe and further afield, including South Africa. It was a tough field with an open-age category, resulting in all 32 gymnasts competing against each other, the ages ranging from 11 to 27 years. Despite being one of the youngest competitors, Gabby achieved personal best scores on the beam and floor, which resulted in her being the highest-scoring Junior (13-14 years) at the competition, placing her eighth overall in the open category and leading her Junior team to fifth place overall -- the highest junior team. Hot on the heels of Gabby are fellow Berkhamsted Gymnastics Club elite squad gymnasts Lydia Sellen and Amber Penaliggon. Lydia achieved national success last year as the national champion for her grade and age level -- another first for the club. Amber has recently qualified for a place at the British Challenge Cup later this month. Both gymnasts are working towards the English Championships next year when they hope to challenge Gabby to even greater heights. 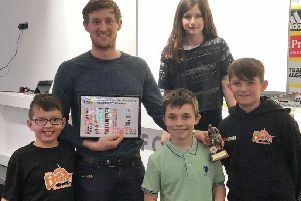 The club, which is based at Ashlyns School, has a charity status and is home to more than 400 members, ranging from pre-school children to elite squads training up to 27 hours a week. Since being founded in 1973, it has evolved from predominantly a men’s artistic club to a mixed but predominantly women’s artistic club, achieving many successes at county, regional and national level in men’s and women’s artistic gymnastics. Those interested in joining the club or qualified gymnastics coaches looking for hours can email enquiries_berkhamsted.g.c@hotmail.co.uk.